Most recent scenario I have been thinking composes of little unusual forces. An idea is to represent fighting withdrawal. Austria has greater number of troops – some which are excellent. 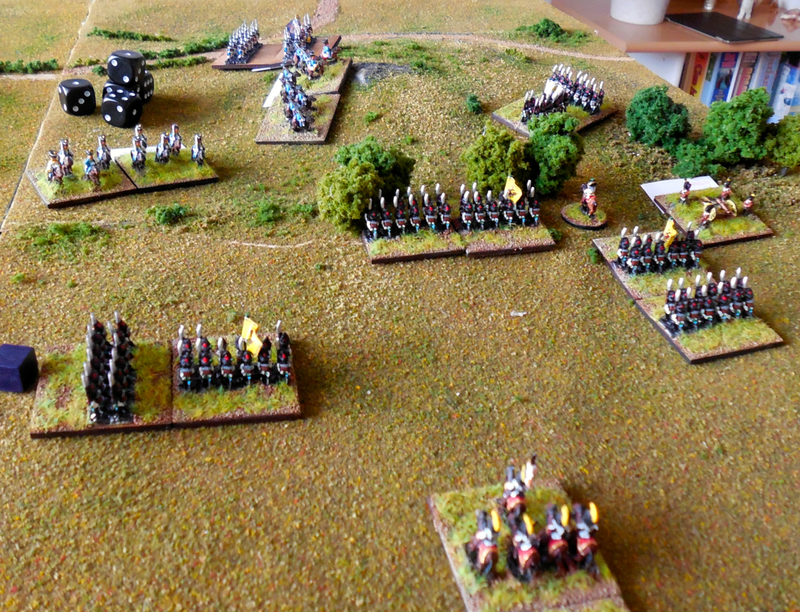 French/Polish have initial terrain advantage, more cavalry to cover retreat and much better command. To storm the village and hold the vital town and crossroads, Austrians have committed following forces. French Light Cavalry Brigade, Brigadier (Q3, Charismatic) [Shaken at 4 DIS]. Alternative Polish Uhlan brigade to replace Frech light cavalry brigade. Brigadier (Q3, Charismatic) [Shaken at 4 DIS]. At the start, French/Poles occupy town in the northwest corner of the map. Each build up sector needs to be occupied by infantry battalion. 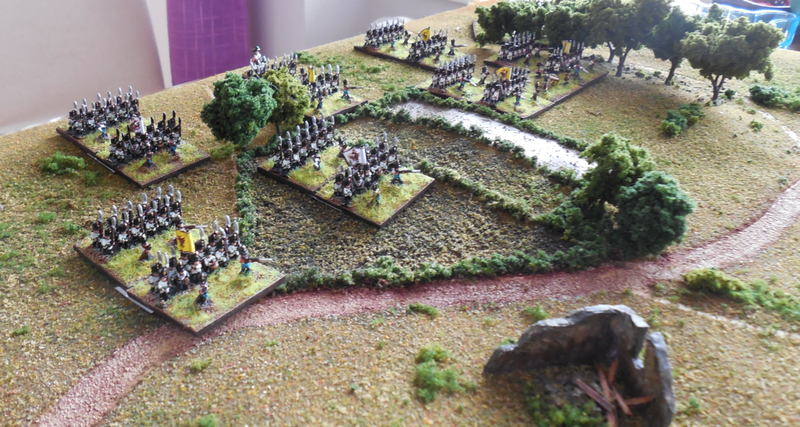 Austrians set up along southern map edge (max 15cm off the edge). Each infantry battalion that French exit along the road in the east edge, break point of the division is increased by 1. 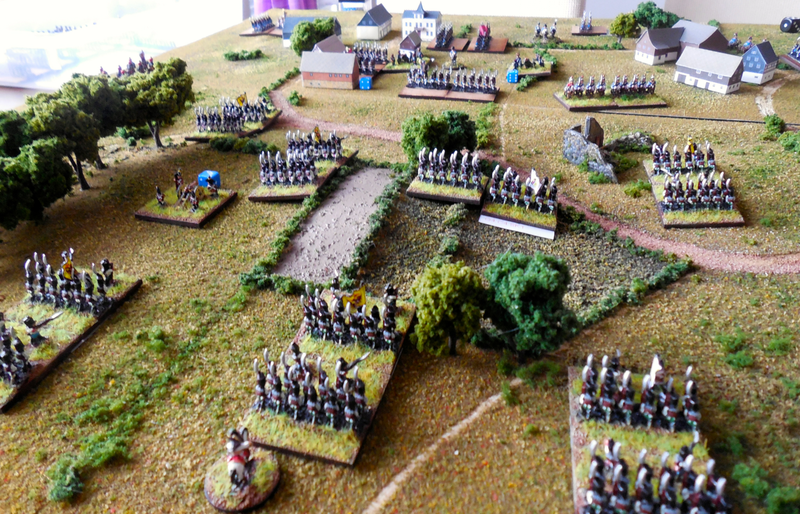 French win minor victory if they hold the town and cause Austrians quit the field but loose control of the road. Austrians win by cutting the path of retreat and causing enough losses to exceed the break point of the enemy. Brigades are shaken normally, but territory gain does not count against break point. My modular board arrangement for this engagement consisted total area of 60cm x 90cm. I thought that the tough Hungarian Grenadier brigade would put up a good fight in capturing the low hill by the escape road and securing artillery position there, supported by a Regiment of reserve cuirassiers if needed. Meanwhile the main body of the army would encircle the town and push Polish out. It was a solid plan so I deployed Austrian infantry columns and one Artillery piece to the fields north of the town and accompanying Hussar regiment to the northwest, hoping to pin some of the infantry there. Grenadiers took the open field in attack columns. French forces were concentrated in the town as expected, elite infantry in the front line, supported by artillery Battery. Since Austrians were first to go, Grenadiers started with good progress and I got them moving out with group activation. This was excellent news, because I needed to be fast in order to secure the hill and block the road. They started to advance towards the hill in good order. Unfortunately, that was all what was going to happen in Austrian side – apparently the main army had still not finished breakfast. Austrian artillery did manage to cause one hit to the buildup sector occupied by Polish regulars but that was all. French side had a real buzz. While the starting position was somewhat scrambled, French elite infantry quickly established perimeter to secure the frontal attack by the Austrian army and rolled reserve artillery to face the not so eager onslaught by Austrians. Two batteries, elite line infantry battalion secured from right flank by town was going to be tough to crack. With the excellent command, French Hussar regiments, supported by light horse battery made all haste along the road to stall the Hungarian Grenadiers. Once again, Hungarian Grenadiers had good momentum and they pushed forward towards the hill. I started to like their efficiency. One battalion reached the hill itself and two others were just behind woods at it’s base. Even the limbered artillery was moving well along. It was evident that French attempted to stall the advance by brining cavalry to the plains. Austrian CinC failed to recognize the threat and release Cuirassiers. On the left, Austrian main army had finished their breakfast and started to act – only to be pushed back mostly to their starting positions by French artillery. Not a good day. Austrian commander was so inefficient in his cautiousness that he could not even get his backside to the frontline. Now, it was French turn to surprise Austrians. Hussar regiment formed a line and closed in aggressively, but did not charge home. In all haste Hungarian Grenadiers formed a square. Not a moment too soon, French horse battery appeared and caused two DIS on the Hungarians. Second Hussar regiment formed a line and charged the grenadier column at the hill. Hussars were beaten. Encouraged by this sudden success, Austrian CinC again refused to release Cuirassiers. French started general withdrawal from the town. Only two battalions and two artillery batteries were left guarding the retreat against seven battalions of line infantry. Battalion after other took march formation along the road, secured in front by Hussars. Now, Austrians had a change of plan, since the general refusal of the main army to attack head along to the town they were to converge towards road between the hill and the town, while Grenadiers would proceed to occupy and secure the hill. Main army got finally into war footing and started to move out from the comfort of their fields. Then happened the inevitable. Hungarian Grenadiers run out of steam and while square was formed on the hill to keep the Hussars at bay but that was it. Yet again, did the CinC withheld the reserves and failed to recognize the threat. Battle of the hill started by French horse artillery beating the square on the plains, now at DIS 3, it was matter of time before square was wiped out. Polish elite infantry battalion marched in attack column over the hill against the Hungarian square and was beaten back, but took no casualties in the progress. Austrians did what they could to restore the beaten square to DIS2, and retreating away from the horse artillery battery field of fire. CinC, again refused to relinquish the Cuirassier regiments, or to act in any other way. The Austrian main army, now pushing towards the road, came to position they could charge the horse battery. This was done with enthusiasm and attack was beaten back by rod wielding men. Horse battery limbered up and retreated to safe distance and soon after pointed gun into the square at DIS3 and beat it to destruction. Infantry battalion was then charged by French cuirassiers that were released from the reserve and run over the battalion with minimal losses (cavalry always takes DIS1 in engagement) for the eventuality that Austrians would field their heavy cavalry. Austrian advance towards the road was now checked. On the hill, yet another charge by Polish elite battalion took place and this time Austrians had no chance. Square was beaten and Polish troops gained control of the hill for now. Seeing the impending disaster (Grenadiers were now solidly spent, and total Austrian losses were 5 at this point and French round 0) put Austrian CinC in action and he hastily released one(!) Cuirassier regiment and Grenadiers were to be withdrawn until Cuirassiers dealt with the Hussars. Since the scenario was to test the rearguard / fighting withdrawal setting, I concluded that scenario is feasible, even if Austrians are able to push more forcefully forward (in which case it could be a close fight). 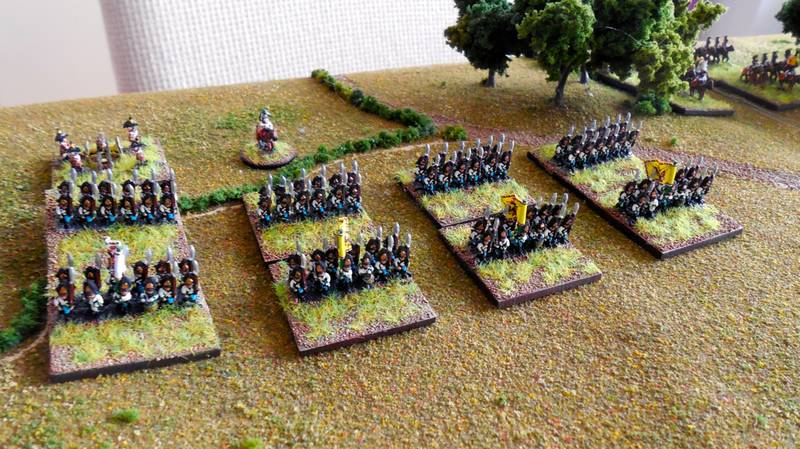 Minor adjustments were needed in the OOB though (eliminate 2nd horse artillery battery from French for instance). This entry was posted in AAR, Drums and Shakos Large Battles, scenarios and tagged 6mm, AAR, Drums and Shakos Large Battles, Modular board, Paper buildings, Scenarios, Wargame terrain. Bookmark the permalink.